Minimum order is 25 coolies. Pricing as low as $0.61 each. You wont be putting your feet in these! 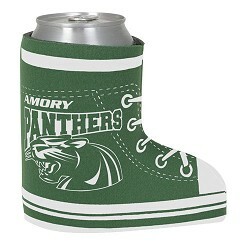 These sneaker koozies will get a 2nd look from everyone when on display and in your hand. Personalized both sides of this sneaker with you logo or message. Size: Fits some 12oz cans & most 12 oz bottles.